I can't believe its March already. It'll be summer before you know it. 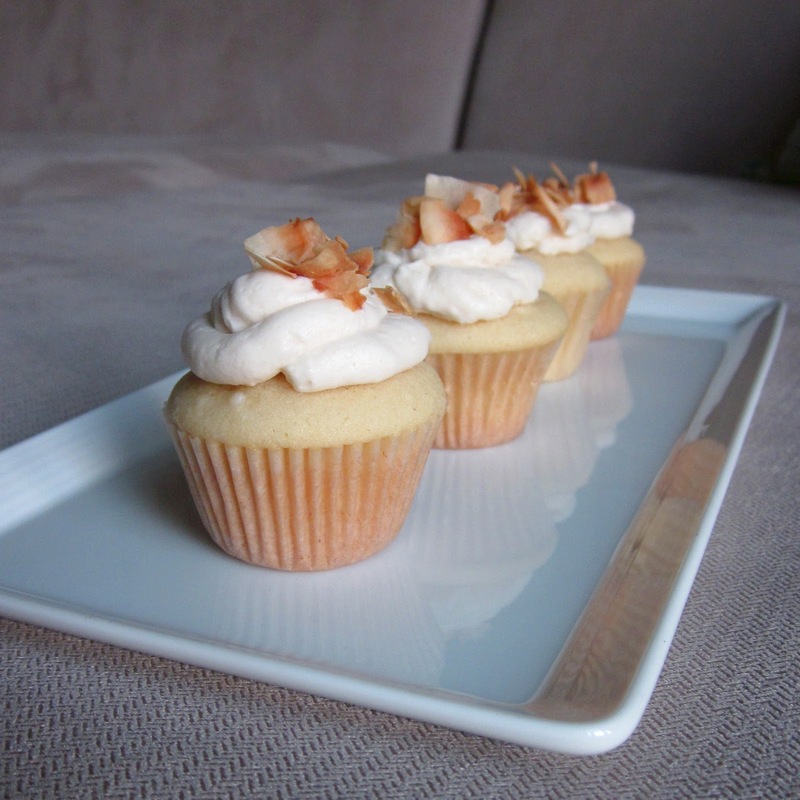 To celebrate the coming of spring and my co-worker/friend, Natalie's birthday, I decided to bake some coconut cupcakes. It's been a while since I made cupcakes, so this was a real treat. They turned out absolutely delicious, light and fluffy. I stuffed them with some custard (naisu) to get an extra layer of texture and flavor. 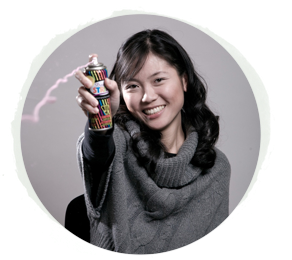 Gary's cousin had brought some canned naisu back from Taiwan but you can also make your own from scratch and steam/bake the filling (since there are eggs in the recipe). Adjust oven rack to lower-middle position and heat oven to 350 degrees. Prepare cupcake pans with liners. Beat egg white and whole eggs in large measuring cup with fork to combine. Add cream of coconut, water, and vanilla extract and beat with fork until thoroughly combined. Combine flour, sugar, baking powder, and salt in bowl of standing mixer fitted with paddle attachment. Mix on lowest speed to combine, about 30 seconds. With mixer still running on lowest speed, add butter 1 piece at a time, then beat until mixture resembles coarse meal, with butter bits no larger than small peas, 2 to 2 1/2 minutes. Divide batter between into cupcake pans. Bake until deep golden brown or when a toothpick inserted into center of cakes comes out clean, about 10-12 minutes. 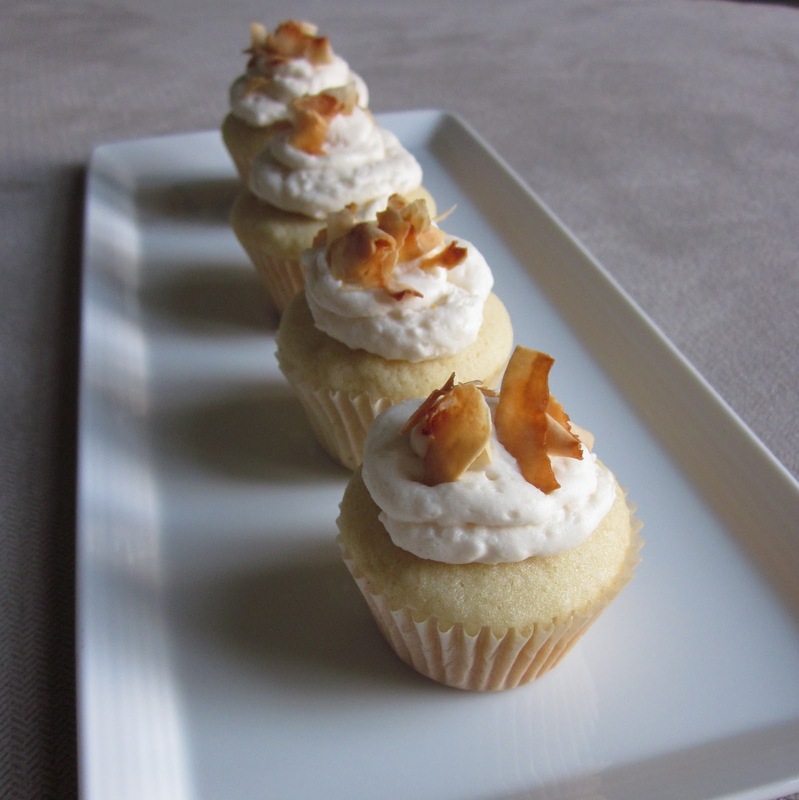 While cupcakes are cooling, spread shredded coconut on rimmed baking sheet; toast in oven until shreds are a mix of golden brown and white, about 15 to 20 minutes, stirring 2 or 3 times. Cool to room temperature. For the Buttercream: Combine all ingredients except for shredded coconut into a mixing bowl, beat on high speed with whisk attachment until fluffy. Stop mixer and scrape bottom and sides of bowl. Add in shredded coconut, and continue to beat at medium-high speed until well-combined, about 1 minute. Those looks great. I am loving those cupcakes.